On Thursday, October 19, a crowd of activists gathered in front of the new Aloft Philadelphia Downtown hotel on the corner of Broad and Arch Streets. Members of Center City Organized for Responsible Development (CCORD), Philadelphians Organized to Witness, Empower & Rebuild (POWER), leaders and members of the Arch Street United Methodist Church, and several other groups rallied around the hotel to protest what they believe was a misuse of Federal and State tax credits. 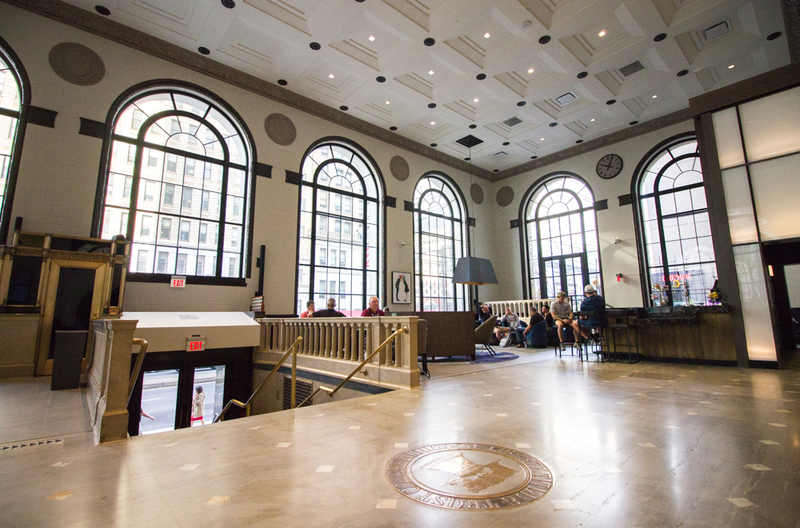 The new hotel opened in August after a total renovation and conversion of the 1924-built Liberty Title & Trust Building into a 179-room hotel with a second floor indoor and outdoor lounge, two retail spaces, and one restaurant space. The developers were a partnership of Berwyn-based Realen Properties and HRI Properties from New Orleans. The project received several a substantial number of tax credits and grants–$10 million in Federal Historic Preservation Tax Incentives, $15 million from two New Market Tax Credits, $2 million from the Commonwealth of Pennsylvania’s Redevelopment Assistance Capital Program (RACP), and a 10-year tax abatement from the City of Philadelphia valued at approximately $6 million, bringing the total to $33 million. CCORD first pushed back at the hotel’s qualifications for those credits and grants last June. The developer’s application for a RACP grant included the promise of 170 jobs to members of the community, 115 positions of which would be for the ongoing operations of a restaurant located at the hotel. That part of the plan was cancelled and a small bar and lounge was installed instead. The restaurant space currently available for lease on the ground floor is not affiliated with the hotel. 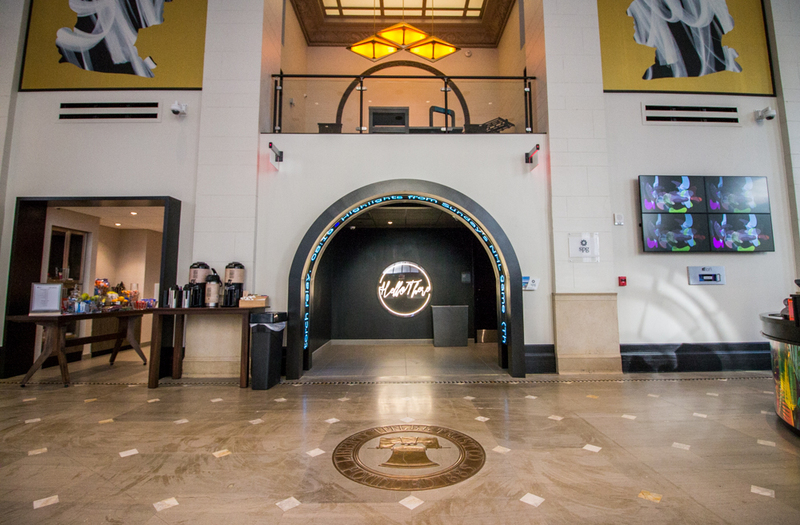 Through public relations firm Bread & Butter, the hotel’s general manager, Evan Evans, told Hidden City, “Aloft Philadelphia is actively seeking a restaurant tenant for the space.” Evans would not provide a clarification of if they mean the lounge area on the 2nd floor or the 1st floor restaurant space currently available for lease. Reverend Robin Hynica, President of CCORD, told Hidden City “There are two ways that this issue can be resolved: create the jobs as promised, or return the $2 million of RACP grant dollars to the state of Pennsylvania.” In Aloft’s RACP grant application, the jobs promised began at a median wage of $31,500 per year. 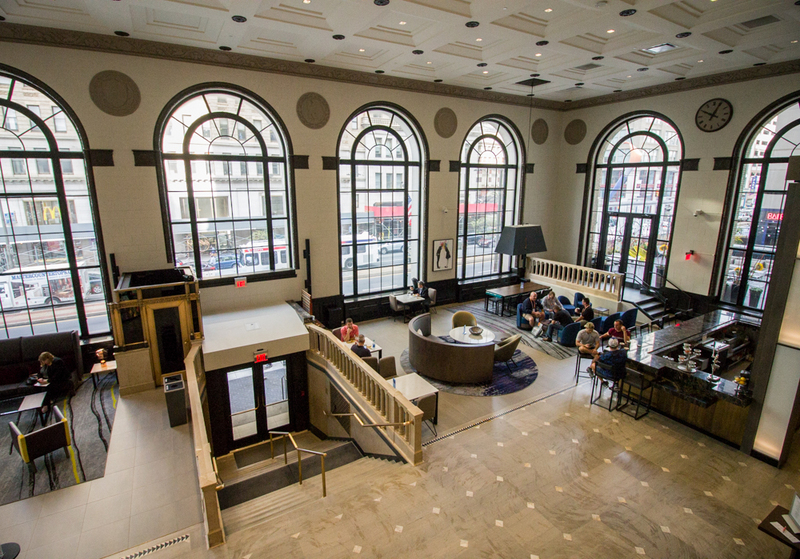 The recently renovated lobby of the Liberty Title & Trust Building for Aloft Philadelphia Downtown hotel. Photographs by Michael Bixler. One central issue brought up by the protesters was the two New Market Tax Credits granted to the developers. This tax credit, created in the 1990s to encourage and assist development in impoverished neighborhoods, has a broad range of qualifications. Criticized from its inception, the tax credit has been used for a number of redevelopment projects that just barely qualify. 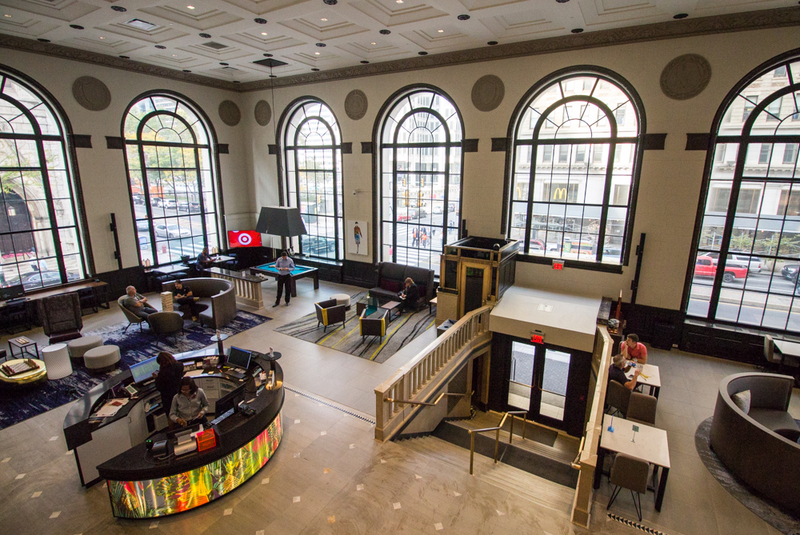 The new Aloft hotel at Broad and Arch Streets is another one, only qualifying for the credits because the census tract in which it is located has a low median family income. On June 12th, U.S. Representative Bob Brady, whose district the hotel is located in, wrote a letter to the Treasury Department denouncing the tax credits. Messages left with the Governor’s press office were not returned by the time of this story’s publication. A small group of activists entered the hotel and got stuck in the elevator, causing the protest to become even more of a scene as the Fire Department showed up to help them. The protest eventually moved onto the Broad Street median. A group of protesters held a sit-in demonstration in the lobby of the hotel and were arrested and issued citations. The Philadelphia Tribune captured video of the lobby demonstration and arrests. You think that’s bad, take a look at the $20 million in taxpayer funds the SLS debacle at Broad and Spruce is ransoming the neighborhood over.